click here Made Wijaya holds forth as Rucina Ballinger and Peter Wall sit bemused. http://www.elne-chauffage-services.com/?p=professional-literature-review-proofreading-lyco-223 The panel rocked from the start, with Made quickly charting the etymological changes of the terms the Balinese use to call outsiders: from tamiu/tamu (guest), to turis, and then finally to the Jakarta slang bule. For those of you who are wondering, the term “bule” is pejorative, and has the connotation of being an albino canine. One of the more amusing things was members of the audience trying to get the definition of the term Super Bule – as if it was in the Oxford lexicon. Coined by Made Wijaya, the definition became more defined as the session went on. term paper for global warming Basically Made is taking aim at middle class foreign people who drop out and into Bali, reinvent themselves, act entitled and are obnoxious. (Made, if I missed something I’m sure you know where the comment box is). They are clearly Made’s pet hate, people who come and tread all over the Balinese and their culture. If you are interested Made years ago also coined the expression ‘the villafication of Bali’, and if you really are interested on more of his coined phrases buy a copy of Stranger in Paradise. There quickly ensued a serious and hilarious (that’s the kind of session it was) discussion on the various social strata that have converged on Bali now. ; beginning with the Super Bule, through the Bule Aga (a take on the “Bali Aga” ancient Balinese cultures) who have been here longer and came to immerse themselves in Bali and it’s culture, to Javanese rich and poor immigrants, through to various levels of Balinese themselves. Wayan Juniartha took a clean shot at Made and called him hopeless romantic. Jun went to say that Balinese don’t really spend 24/7 on ceremonies, they want to be modern just like everyone else. 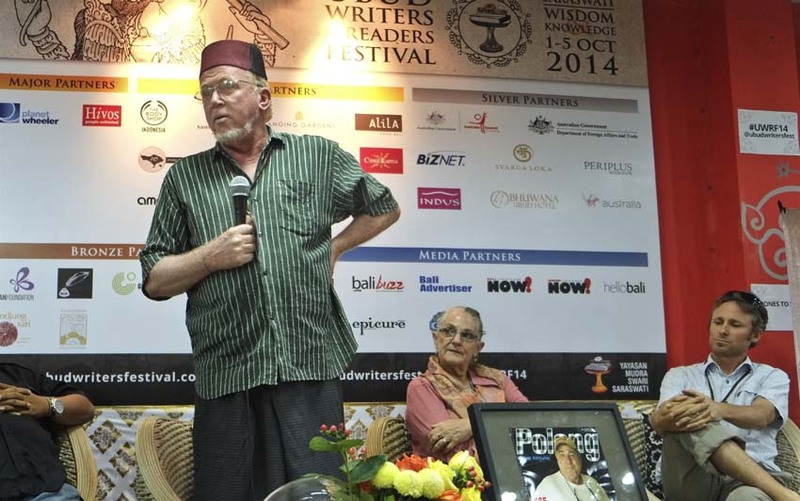 He also suggested that without tourism Balinese culture would have long been swallowed up. Putu Semiada pointed out that the school he runs is subsidized by foreign donations, if weren’t for Bules there would be no program. One poignant quote from Putu: “Take what you want but leave us our gods”. Rucina Ballinger pointed to her experience in her village just days after the infamous bombings in Kuta : as she sat preparing for a religious ceremony with the women of the community, not one person discussed the recent events only 7km away, instead the conversations were about the preparations for the gods. There were also some heartfelt statements: a young boy of mixed Indonesian-English parentage asked what he should classify himself to be: Indonesian, English, or something else? (Peter Wall chimed in and said that there is such a thing as the third culture, something new. It was bit of a pity that Peter got caught up soft selling Hubud when we would have loved to have heard more about his experiences in bringing new economic opportunities to the Balinese, something which he barely touched on). Another expat went on to say how he never came to Bali before because of all the stories he had read about the bogans in paradise (g’wan, google it), but that it was a place where he came for his retirement and he has never felt happier and more alive in his life surrounded by Balinese culture, music, art, and villagers. He got a standing ovation. There’s much more that was said and that happened but I have to run to the next panel.